Ferrari will show a Spider version of its fantastic looking 458 Italia at Frankfurt. 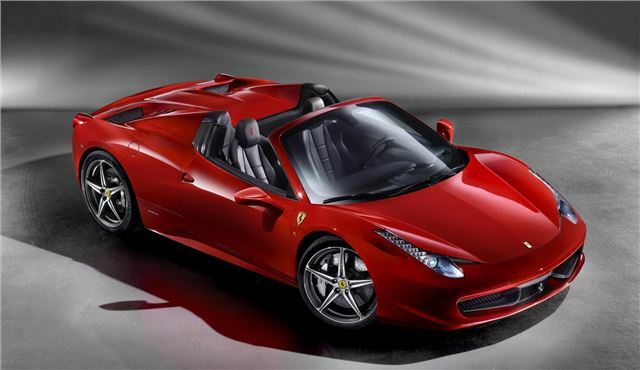 The 458 Spider will feature a folding hard top – the first mid-rear engine car of its type with such a design. Power still comes from an award winning 4.5-litre V8 engine, and the gearbox, a dual-clutch paddle shift system, remains the same. Top speed is around 200mph, and 0-62mph takes just 3.4 seconds. The exhaust note has been tuned so the occupants can enjoy it more when the roof is down. Combined cycle fuel consumption, if it really matters in such a car, is 24mpg, with CO2 emissions of 275g/km. The folding hard top is made from aluminium to keep weight down, and weighs in at 25kg less than a folding fabric roof would have. It folds into the area between the cabin and the engine bay, leaving space for a luggage bench behind the seats. There is an electronic wind stop which reduces the buffeting associated with cabriolets, and it allows conversation to be held at normal levels even at speeds as high as 125mph. Pricing is yet to be announced, but expect the 458 Spider to be around £200,000.